In chiropractic there are many different approaches. Dr Rock is often asked what type of chiropractic does he practice? What techniques do you use? In short, he considers himself an evidence influenced chiropractor. Dr Rock strives to stay up to date with the latest advancements in his profession and uses chiropractic techniques that are evidence based. Some people like a firm chiropractic technique and others like a no cracking technique. Dr Rock offers both. He wants the patient to have a good experience with each treatment. Most of all… he wants what you want… results! These techniques have been around for ever because they work. First, an analysis of your spine is performed. This involves a case history, examination and sometimes X-rays of your spine. Subsequent visits will include feeling the spinal joints move as you turn and bend. A leg check may be performed, to uncover an imbalance in the lower spine and pelvis. The energy delivered during the thrust may produce a slight ‘popping’ sound from the shifting of gas and fluids in the joint. This sound may be interesting, but it is not a guide as to the value or effectiveness of the adjustment. Dr Rock uses the latest chiropractic technology in caring for you using the impulse IQ adjusting instrument. This device delivers a gentle precise computer-aided chiropractic adjustment to relieve pain and restore function. The Impulse IQ has a micro-computer housed within the device which produces a controlled force that can treat all areas of the body. The instrument also has a high-tech sensor that responds to your body’s response to the chiropractic adjustment. Years of research have gone into the development of this adjusting instrument to create gentle specific chiropractic adjustments that are safe and effective for patients of all ages. 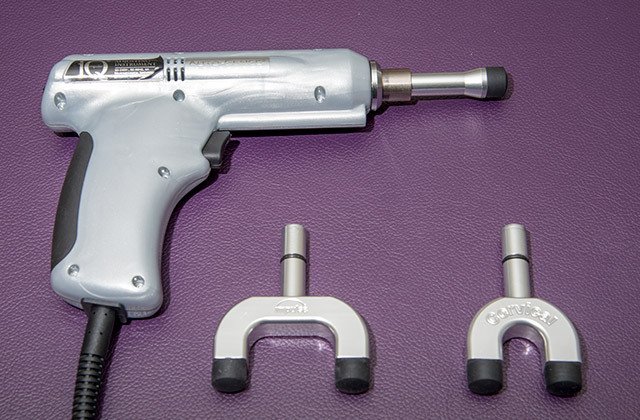 The impulse is twice as fast as other adjusting instruments and 100x faster than manual chiropractic adjustments. The gentle thrust is faster than the body’s tendency to tighten up and resist the adjustment. People who don’t like the cracking sensation with other chiropractic techniques love the Impulse IQ as it is very specific and effective chiropractic treatment. Dr Rock is the first and only chiropractor on the Darling Downs that uses this advanced technology. 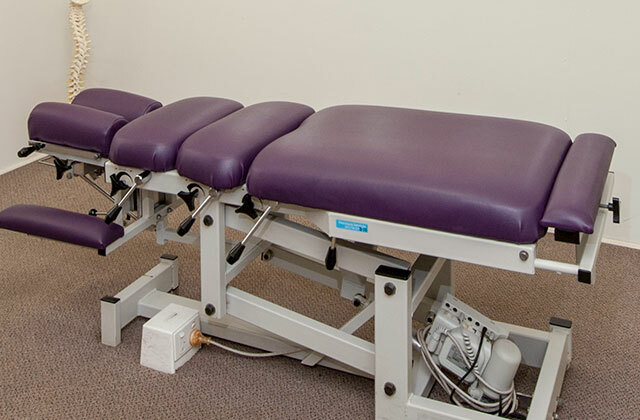 A chiropractic drop table is a specially designed table which has moving parts which lift and drop down. The patient maintains a relaxed and neutral posture while the Doctor applies a specific controlled force with their hands. The drop delivers a, quick, short, Chiropractic adjustment at the end. The mechanism has adjustable tension so the doctor can apply the right amount of pressure needed to correct the problem. It is quite a comfortable way to be treated. The bones, nerves and muscles of the body allow us to move. When spinal joints (or other joints of the body) aren’t moving correctly, it’s a sign that something else is going on. We use a helpful diagnostic procedure called Motion Palpation. Motion Palpation is a fancy way of saying, “feeling with the hands and fingers.” We’ll have you turn and bend and go through the range of motion of various joints of your body. As you do, we’ll apply a light pressure to the joint being tested to feel how well it is moving. Not only will we feel the joint, but we’ll also listen as you move. Long-standing problems can often produce grinding sounds or other noises. These can often give us a clue about what’s going on in the affected joint; directing the care we will be recommending. Motion palpation is a popular diagnostic technique used by chiropractors since 1981. It quickly gained acceptance and is taught at most chiropractic colleges throughout the world. Please contact the Toowoomba Chiropractic Centre with any questions.